A spinal arachnoid cyst is a rare condition that can affect people of any age group. As the symptoms can be variable and non-specific, the condition is often misdiagnosed. What are spinal arachnoid cysts? Spinal arachnoid cysts are sacs filled with cerebrospinal fluid. They are situated between the spinal cord and one of the membranes that cover the central nervous system (the arachnoid membrane) and can occur at any spinal level. Males are around 4 times more likely to have spinal arachnoid cysts than females. What causes spinal arachnoid cysts? Primary spinal arachnoid cysts: Primary spinal arachnoid cysts occur as the result of a congenital abnormality. They are present at birth and occur during the first few weeks of gestational development. This type of spinal arachnoid cyst is usually diagnosed before the age of 20 years and sometimes within the first year of life. The group most likely to present with this condition are teenage boys. 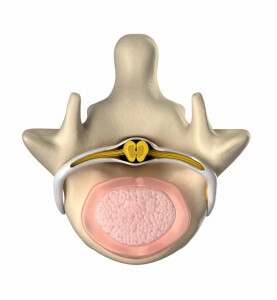 Secondary spinal arachnoid cysts: Secondary spinal arachnoid cysts are not as common as primary arachnoid cysts and may occur as the result of trauma, meningitis or spinal surgery. What are the symptoms of spinal arachnoid cysts? Some people who have spinal arachnoid cysts have no symptoms at all. In these people, the cyst is usually found when a MRI or other scan is performed for unrelated reasons. If you have been diagnosed with a spinal arachnoid cyst, your doctor will firstly thoroughly investigate your condition to help determine the best treatment. You will be sent for a number of scans, probably including an MRI. If the cyst is very small, or if you have no symptoms, your doctor may advise a ‘wait and see’ approach and your condition will be closely monitored. For most people with spinal arachnoid cysts, surgery is recommended to completely remove the cyst and take the pressure off the spinal cord. Your doctor will discuss with you in detail the surgical technique that is recommended for your condition. Surgical techniques for this condition have improved greatly in recent times and most people will make a rapid and full recovery from this condition.